Description: One of the first city plans of Moscow, this the iconic 16th century image associated with the mapping of the city. Original hand colour. Description: Moscow. Early city plan of Moscow based on the survey commissioned by Boris Godunov. Coloured. Description: Stunning 17th century view of Moscow with acute detail given to its buildings and fortresses. The crest of the Russian Empire sits to the top right. Description: Famous plan of Moscow based on the survey commissioned by Boris Godunov. Glorious original colour. Description: The Kremlin from Blaeu's monumental work first issued in 1662. Glorious original colour. Description: Miniature city plan of Moscow with figurative scene in foreground of men farming land. Coloured. Description: Kremlin. Early plan. Coloured. Description: Splendid city plan of St. Petersburg with text panel description listing to city landmarks. Original colour. Description: Magnificent mid-18th century plan of St. Petersburg based on a wall map made by the order of the Empress Elizabeth. Description: Late 18th century plan of St. Petersburg with a key on the upper right. Coloured. 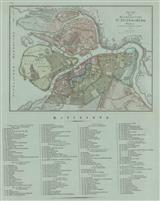 Description: Striking German city plan of St. Petersburg with listing of landmarks and locations of interest. Unusual blue paper and elegant original hand colour. Description: Attractive plan of Moscow with a view of the city from Sparrow Hill, and a vignette of the Church of Assumption in the Kremlin. Original colour. 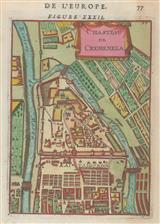 Description: City plan of St. Petersburg with an illustrated border showcasing famous buildings of the city. 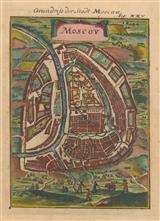 Part of a famous series of city plans produced by Meyer 1843-60. Coloured. 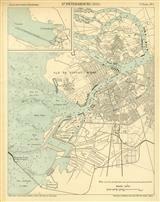 Description: Plan of St. Petersbourg with an inset showing the maritime approaches to the city.Printed colour. Description: Detailed plan of the port and city of St. Petersburg including Kotlin Island and the fortified town of Kronstadt. Printed colour. Description: Attractive map of St. Petersburg and its environs. Printed colour.